In southwest Bulgaria, Slavic Muslims—aka Pomaks—hold traditional wedding ceremonies in the winter months. In this photo, newlyweds Selve Kuivashi (left) and Djamal Vurdal pose on their wedding-night bed in the village of Ribnovo. 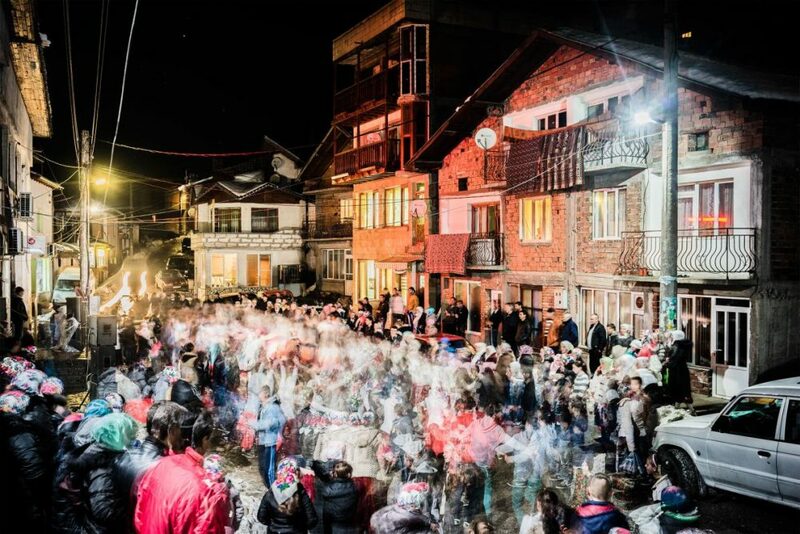 In Ribnovo, Bulgaria, the traditional winter weddings of Slavic Muslims—aka Pomaks—span two days and involve the entire village. THE SYRIAN REFUGEE crisis has brought international attention to Muslims in Europe. It’s also given rise to a new wave of anti-Islamic sentiment. But as photographer Guy Martin shows in his photos of Ribnovo, Bulgaria, Muslim communities have long been an established part of the Continent. The remote village of Ribnovo is one of two in the country that hold regional types of Slavic Muslim—or Pomak—wedding ceremonies. These take place every winter, the traditional wedding season. In Ribnovo, a wedding party does the traditional houra dance for Salve Kgiselova and her groom, Reihan Kiselov. Ribnovo Pomak weddings last for two full days, spanning all of Saturday and Sunday. 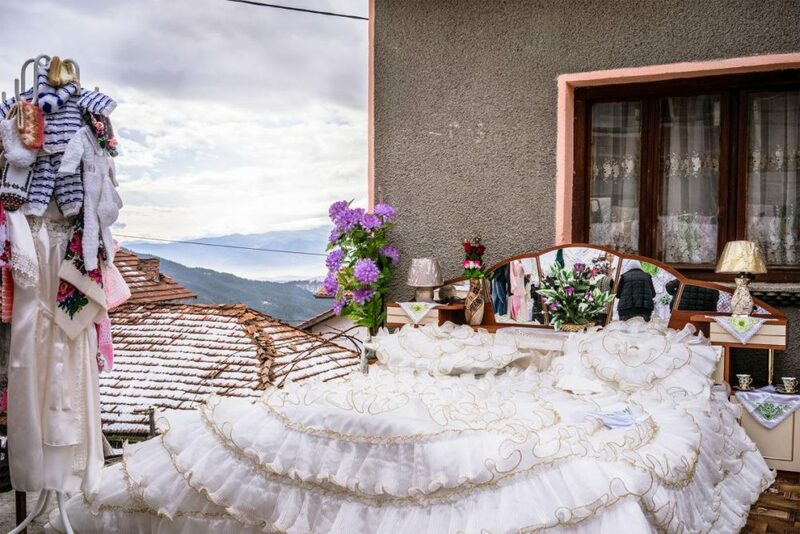 Every winter weekend in Ribnovo, you can see people dancing, eating, and building elaborate bedrooms to celebrate new brides and grooms. These bedrooms, says Martin, are setup early on Saturday morning outside the bride’s family’s house. They’re meant to show family, friends, and neighbors what the couple’s new life will look like—and also to show off: The bigger and more elaborate the set-up, the better. Salve Kiselova emerges with her makeup finished and her eyes closed, tinsel covering her face. Community involvement is key. Martin says the scaffolding, for instance, usually takes “up to 10 or 15 men to build.” Then there’s the task of setting up the bedroom and dismantling it all at the end of the day. “It takes an army of 50 to 60 people each wedding,” Martin says. After the morning bedroom spectacle, the bride’s family hosts a Saturday-afternoon celebration. 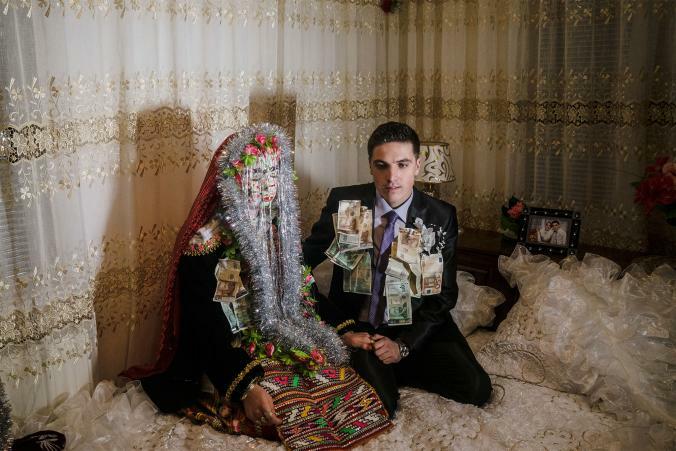 Pomaks eat, pin money on the bride and groom, and dance the traditional houra in the village square. Later, in the evening, the bride and her friends might paint their hands with henna. Young people will end the night at coffeehouses, smoking and talking. The next day, it all happens again. The bedroom set and the gifts come out in the morning; the groom’s family hosts another party in the afternoon. Outside a Pomak bride’s family’s house, a wedding bedroom awaits its new inhabitants. But on Sunday night, the bride doesn’t just have her hands painted with henna. 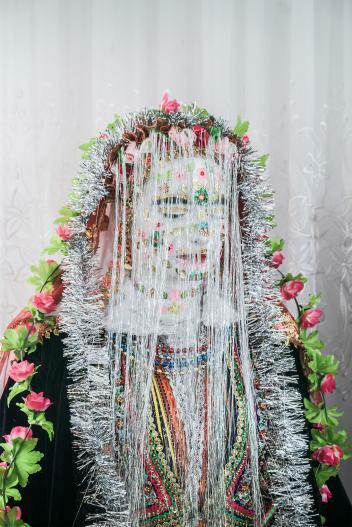 She also lies down while her female friends and relatives carefully decorate her face with white paint and jewels—a process called gelina that Martin says can take hours. 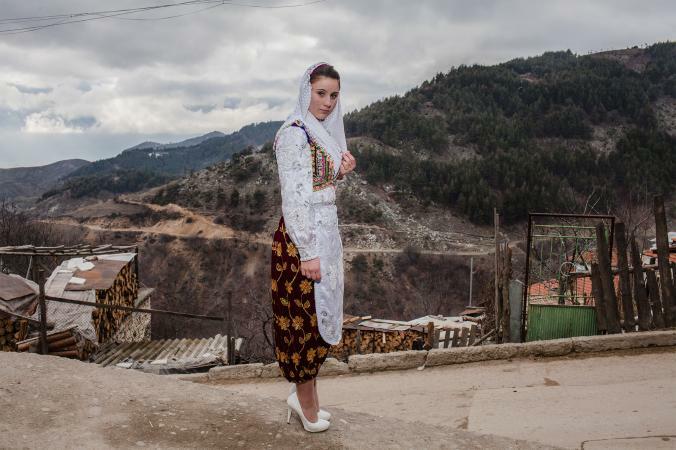 Wearing traditional attire, a young woman in Ribnovo makes her way to Letve Osmanova and Refat Rvdikov’s wedding celebration. At that point a crowd gathers outside, and the bride and groom stand before them for up to an hour, receiving gifts and having their pictures taken (all with the bride’s eyes still closed). An imam might say a blessing or a prayer. Then the bride begins her ceremonial walk to the house of her husband’s family. “The bride and groom—it doesn’t matter if they live next door to each other or if they live a mile away from each other—will have to walk … while her eyes are closed,” says Martin. 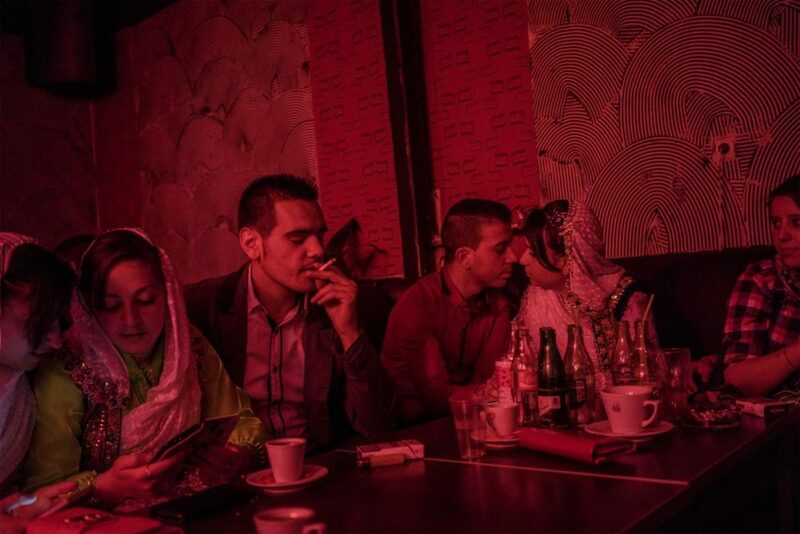 Before the houra dance at the wedding of Fatme Inuz and Feim Osmanov, teenagers smoke, flirt, and cuddle in a café. Once they arrive, the groom’s family follows the newlyweds up to their bedroom. The groom’s relatives may lift a red veil from over her face—a throwback to when all marriages were arranged—so that they can symbolically meet her. After that, everyone (finally) leaves the newlyweds be, for three full days. 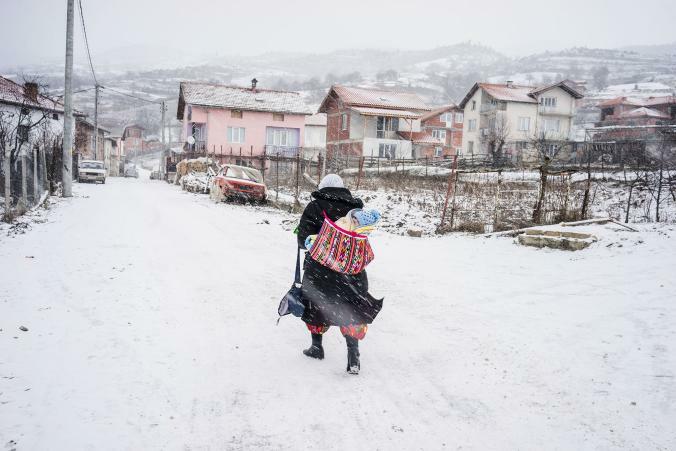 In Ribnovo, a Pomak woman carries her baby in the snow. Though Martin says that the Pomak wedding tradition is firmly in place, it remains to be seen whether young people from Ribnovo—exposing themselves to new ideas when they move abroad—will keep coming home to wed.